Nevron Gauge for SQL Server Reporting Services (SSRS) 2005/2008 is an advanced report item, which delivers a complete set of gauge types, highly customizable axes, tight data integration and unmatched visual effects to your reports. Nevron Gauge for Reporting Services will also improve your report authoring experience, with its polished visual editors, refined settings and well-organized structure. 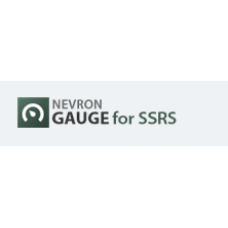 Nevron Gauge for SSRS is an ideal addition for any advanced Business Intelligence, Scorecard, Presentation, Scientific or general purpose report. 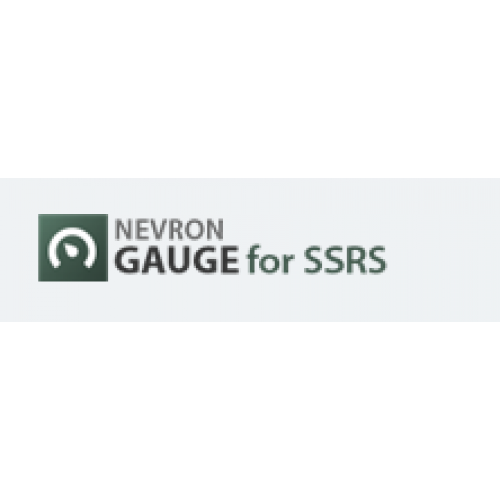 Nevron Gauge for SSRS is a tool for any Business Intelligence, Scorecard, Presentation, Scientific or general purpose report. Radial Gauge Subtypes: Radial, Quarter North East, Quarter North West, Quarter South West, Quarter South East, Half North, Half South, Half West, Half East and Custom. When using Custom subtype the user can specify custom begin angle, sweep angle, border style etc. Linear Gauge Subtypes: Horizontal and Vertical. Numeric Display Styles: Seven Segment Normal, Seven Segment Rounded, Seven Segment Rectangular, Fourteen Segment Normal, Fourteen Segment Rectangular, Fourteen SegmentInset, Matrix Rectangle and Matrix Circle. Nevron State Indicators are supplementary gauges, typically used to visually prompt the user that a value has entered a critical range. Complete set of axis related features designed to target even the most compelling charting requirements. The axes are also largely automatic allowing you focus on your project and be able to customize every aspect of the appearance and behavior of the axis if needed. Radial and Linear gauge types support an unlimited number of axes, packed with a complete set of features designed to solve even the most complex gauge requirements. Axes can be docked to the gauge sides (or rim) or arbitrary positioned in the gauge model space. In addition you have control over the begin / end axis position relative to the gauge area. Control over the ruler position and appearance. Support for major and minor ticks with control over their appearance and position. Axis Stripes highlight repeating ranges of data on the gauge background, with a controllable show/hide pattern. Axis Sections conditionally modify the appearance of axis ticks, gridlines and labels, provided they are within a user-specified data range(s). This feature helps you to highlight important ranges of data along the axis. Nevron Gauge for Reporting Services provides advanced axis-label layout options, which let you resolve complex axis-label overlapping cases. Label Formatting controls the formatting of values along numeric scales. Many advanced options for currency, percentage, scientific and date time label formatting are available. Linear and Radial Gauges support an unlimited number of pointer and range indicators. Ranges help you visualize the coverage of a values range on a certain axis. You have full control over the range offset from scale, appearance and paint order. Pointers help you visualize a value on a certain axis. Radial gauges support numerous needle styles. Both linear and radial gauges can display pointers as markers. Both marker and needle pointers allow you to have full control over the pointer offset from scale, appearance and paint order. Min - finds the min value from a set. Max - finds the max value from a set. Average - finds the average value from a set. Nedian - finds the value that splits the set in half (e.g. half of the values are smaller than median value and half are larger). Percentile - finds the value that splits the set in a custom percent. First - gets the first value from a set. Last - gets the last value from a set. Gauge Code Customization - Nevron Gauge for Reporting Services supports customization through C# code, which allows you to use the full Nevron Chart for .NET API in SSRS.